We’d love your help. Let us know what’s wrong with this preview of Sidewalk Flowers by JonArno Lawson. To ask other readers questions about Sidewalk Flowers, please sign up. For what age child would you recommend this book? Rosemary Sullivan "The New York Times" review of the book, http://www.nytimes.com/2015/07/12/boo..., recommended ages 3-8. Really a cute and beautiful picture book. Caught my attention because it was nominated last year by Goodreads. Otherwise I probably would not have found it, it is not my usual type of book. 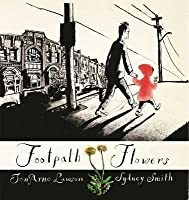 Without text, it tells the story of a small girl going home with her somewhat distracted father in a big city, while she finds flowers in the sidewalk, collects them and in the end gives those flowers to various beautiful purposes. The use of black and white drawings combined with only the red of her coat, in Really a cute and beautiful picture book. Caught my attention because it was nominated last year by Goodreads. Otherwise I probably would not have found it, it is not my usual type of book. 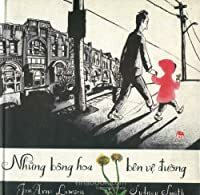 Without text, it tells the story of a small girl going home with her somewhat distracted father in a big city, while she finds flowers in the sidewalk, collects them and in the end gives those flowers to various beautiful purposes. The use of black and white drawings combined with only the red of her coat, increasing to more use of color and full color at the end of the book is just wonderful. I'll keep it next to me to leaf through for a while... Thing is, you keep discovering tiny wonderful details in the drawings. A book that tells its tale without words, but with great drawings...A picture book for all ages. This book has no words. - sticking them in a sleeping homeless man's shoe. - slipping them under a dog's collar. - When she gets home, putting them in her mother's and little brother's hair, and putting them in her baby sibling's stroller. The illustrations are a little ugly. This book has no words. The illustrations are a little ugly. But the authors do an excellent job of using color. They have also captured the urban environment perfectly. The people seem real even though there is no talking. Perhaps more so because there is no talking. In this picture book, a little girl takes a walk through the city with her father and while on the journey, she decides to start collecting little wildflowers she discovers along the way. Her father is busy doing his own thing and is quite distracted. By the time they’re about ready to head home, she has collected a beautiful bouquet of flowers. What she decides to do with the flowers on her way back home is touching. Follow along in this beautiful picture book to see how sweet, caring, and creative she can be. The story is touching and will help children understand the importance of giving and thinking about others. The illustrations were eye catching with the majority of the pages being black and white with splashes of color throughout. It’s definitely a keeper. When you live in a city, nature's successes can feel like impositions. We have too many pigeons. Too many squirrels. Too many sparrows, and roaches, and ants. Too many . . . flowers? Flowers we don’t seem to mind as much but we certainly don’t pay any attention to them. Not if we’re adults, anyway. Kids, on the other hand, pay an exquisite amount of attention to anything on their eye level. Particularly if it’s a spot of tangible beauty available to them for the picking. Picture books have so ma When you live in a city, nature's successes can feel like impositions. We have too many pigeons. Too many squirrels. Too many sparrows, and roaches, and ants. Too many . . . flowers? Flowers we don’t seem to mind as much but we certainly don’t pay any attention to them. Not if we’re adults, anyway. Kids, on the other hand, pay an exquisite amount of attention to anything on their eye level. Particularly if it’s a spot of tangible beauty available to them for the picking. Picture books have so many functions, but one of them is tapping into the mindset of people below the ages of 9 or 10. A good picture book gets down to a child’s eye level, seeing what they’re seeing, reveling in what they’re reveling in. Perspective and subject matter, art and heart, all combine with JonArno Lawson and Sydney Smith’s Sidewalk Flowers. Bright spots of joy and comfort, sometimes it takes a kid to see what anyone else might claim isn’t even there. A girl and her father leave the grocery to walk the city streets home. As he leads, he is blind to the things she sees. A tattooed stranger. A woman in a cab. And on one corner, small dandelions poking out of the sidewalk. As the two walk she finds more and more of the beauties, and gathers them into a bouquet. Once that's done she finds ways of giving them out. Four to the dead bird on the sidewalk. One to the homeless man asleep on the bench. Five tucked into the collar of a dog. Home once more she plants flowers in her mother's hair and behind her brothers' ears. Then, with the last blossom, she tucks it behind her own ear. That done, she's ready to keep walking, watching and noticing. Now JonArno Lawson, I know. If I had my way his name would grace the tongue of every children’s librarian in America. However, he is both Canadian and a poet and the dual combination dooms his recognition in the United States. Canadians, after all, cannot win most of the American Library Association awards and poets are becoming increasingly rare beasts in the realm of children’s literature. Time was you couldn’t throw a dart without hitting one or two children’s poets (albeit the slow moving ones). Now it sometimes feels like there are only 10-15 in any given year. Treat your children and read them The Man in the Moon Fixer’s Mask if ever you get a chance. Seen in this light, the idea of a poet turned wordless picture book author is unusual. It’s amazing that a man of words, one that finds such satisfaction in how they are strung together, could step back and realize from the get-go that this story could be best served only when the words themselves were removed. A picture book as an object is capable of bringing to the attention of the reader those small moments of common grace that make the world ever so slightly better. 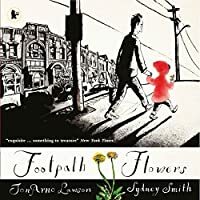 In an interview with Horn Book editor Roger Sutton, author JonArno Lawson cited the inspiration for this book: “Basically, I was walking with my daughter down an ugly street, Bathurst Street, in Toronto, not paying very close attention, when I noticed she was collecting little flowers along the way . . . What struck me was how unconscious the whole thing was. She wasn't doing it for praise, she was just doing it.” I love this point. The description on the back of this book says that “Each flower becomes a gift, and whether the gift is noticed or ignored, both giver and recipient are transformed by their encounter.” I think I like Lawson’s interpretation better. What we have here is a girl who is bringing beauty with her, and disposing of it at just the right times. It becomes a kind of act of grace. Small beauties. Small person. Now we know from Roger’s interview that Lawson created a rough dummy of the book and the way he envisioned it, but how artist Sydney Smith chose to interpret that storyline seems to have been left entirely up to him. Wordless books give an artist such remarkable leeway. I’ve seen some books take that freedom and waste it on the maudlin, and I’ve seen others make a grab for the reader’s heart only to miss it by a mile. The overall feeling I get from Sidewalk Flowers, though, is a quiet certitude. This is not a book that is pandering for your attention and love. Oh, I’m sure that some folks out there will find the sequence with the homeless man on the bench a bit too pat, but to those people I point out the dead bird. How on earth does an artist show a girl leaving flowers by a dead bird without tripping headlong into the trite or pat? I’ve no idea. All I know is that Smith manages it. Much of this has to do with the quality of the art. Smith’s tone is simultaneously serious and chock full of a kind of everyday wonder. His city is not too clean, not too dirty, and just the right bit of busy. For all that it’s a realistic urban setting, there’s something of the city child to its buzz and bother. A kid who grows up in a busy city finds a comfort in its everyday bustle. There are strangers here, sure, but there’s also a father who may be distracted but is never any more than four or five feet away from his daughter. Her expressions remain muted. Not expressionless, mind you, but you pay far more attention to her actions than her emotions. What she is feeling she’s keeping to herself. As for the panels, Smith knows how to break up each page in a different way. Sometimes images will fill an entire page. Other times there will be panels and white borders. Look at how the shelves in a secondhand shop turn the girl and her dad into four different inadvertent panels. Or how the dead bird sequence can be read top down or side-to-side with equal emotional gut punches. The placement of each blossom deserves some credit as well. Notice how Smith (or was it Lawson?) chooses to show when the flowers are bestowed. You almost never see the girl place the flowers. Often you only see them after the fact, as the bird or dog or mother remains the focus of the panel and the girl hurries away. The father is never bedecked, actually. He seems to be the only person in the story who isn’t blessed by the gifts, but that’s probably because he’s a stand-in more than a parent. For adults reading this book, he’s a colorless reason not to worry about the girl’s capers. His purpose is to help her travel across the course of the book. Then, at the end, she takes the last remaining daisy, tucks it behind her ear, and walks onto the back endpapers where the pattern changes from merely a lovely conglomeration of flower and bird images to a field. A field waiting to be explored. The use of color is probably the detail the most people will notice, even on a first reading of the story. In interviews Lawson has said that folks have told him that the girl’s hoodie reminds them of Peter in The Snowy Day or Little Red Riding Hood. She’s a spot of read traveling through broken gray. Her flowers are always colorful, and then there are those odd little blasts of color along her path. The dress of a woman at a bus stop is filled with flowers of its own. The oranges of a fruit stand beckon. The closer the girl approaches her home, the brighter the colors become. That grey wash that filled the lawns in the park turn a sweet pure green. As the girl climbs the steps to her mother (whose eyes are never seen), even her dad has taken a rosy hue to his cheeks. After you pick up your 400th new baby book OR story about an animal that wants to dance ballet OR tale of a furry woodland creature that thinks that everyone has forgotten its birthday, you begin thinking that all the stories that could possibly be told to children have been written already. Do not fall into this trap. 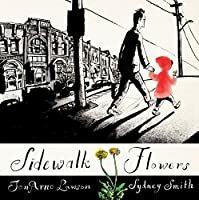 If Sidewalk Flowers teaches us nothing else it is that a single child could inspire a dozen picture books in the course of a single hour, let alone a day. There’s a reason folks are singing this book’s praises from Kalamazoo to Calgary. It’s a book that reminds you why we came up with the notion of wordless picture books in the first place. Affecting, efficient, moving, kind. Lawson’s done the impossible. He wrote poetry into a book without a single word, and you wouldn’t have it any other way. Sidewalk Flowers is told with no words. A walk with a little girl and her father depicted in pictures. But so many words and emotions flow and move and live on the pages. So many words can be seen in the art, in the colors, in the details, and in the actions of a little girl and her flowers. Adorable. Kind. Sad. Healing. Caring. Sharing. Heart. And Unforgettable. The world would be an ugly place without the little acts of kindness. Something as small as a wave or a flower can brighten and affect someone’s whole day. The way the pages change after every flower, gift and gesture is inspiring and beautiful to flip through. The splashes of color alter the whole scene and world! I highly recommend this beautiful work of art. It will make you feel a little better about the world around you. Make you smile and hope for the world around you. p.s. Notice what happens to the pages and colors when Dad finally gets off the phone! I'm glad I stopped by the Groundwood booth at ALA midwinter. This is a moving picture book featuring a child noticing others and sharing kindness with them. A wordless reminder to pay attention and that random acts of kindness add color to our world. This book is a gem. This little girl might grow up to be Miss Rumphius! The art is amazing and children and adults will have much to examine, ponder, and discuss after reading this. Who needs May Day baskets when you can tuck flowers in your dog's collar! I'm eager for the snow to melt here so I can look for sidewalk flowers--Queen Anne's Lace is one of my favorites to pick from the roadside. Ah... this book was describing how I look to this world wordlessly! it is always that the unnoticed is what gives us the most closest sweet and gracious feeling we can ever get.. I hope one day we p[en our eyes and ears to discover and listen devotionly to what god is sending to us.. they may be so close to us that we really don't notice. The artwork in this wordless picture feels like a throwback to iconic classics like Make Way for Ducklings. A young girl walks through the city with her preoccupied father and finds flowers growing through the pavement. There are so many lessons here, but maybe most importantly we're reminded that beauty is always there if we look for it. Sidewalk Flowers follows a little girl as she walks through the city with her father. While he spends most of his time on the phone, she collects sidewalk flowers and then gives them out to people and animals she meets along the way. In the beginning, only the girl is in colour- wearing a vivid red cloak- along with the flowers she spots in a black and white city full of black and white people. But as she noticed things- a patterned dress, a vase, a bird- they too become brightly coloured and by Sidewalk Flowers follows a little girl as she walks through the city with her father. While he spends most of his time on the phone, she collects sidewalk flowers and then gives them out to people and animals she meets along the way. In the beginning, only the girl is in colour- wearing a vivid red cloak- along with the flowers she spots in a black and white city full of black and white people. But as she noticed things- a patterned dress, a vase, a bird- they too become brightly coloured and by the end of the book the whole world is vivid. Very simple concept, very effectively executed. My heart just about stopped when I saw the image of the flowers left as a memorial for a dead bird. You can't throw a stone without hitting a wordless picture book these days. Wordless picture books invite contemplation in a way that other picture books don't. That isn't to say the experience is better, but different. How the story is shared becomes a truly personal experience. Do you make a story up as you go through the book with a child? Is it the same or different each time? Do you give the book to a child (or adult) and have her sit silently and experience the book in her own head? There is more room- or at least more space- for imagination. Some picture books are kinetic and invite laughter and action (The Book With No Pictures, Pete the Cat, The Day The Crayons Quit, Goodnight Already), but this is the perfect example of the opposite kind of book, inviting meditation and encouraging mindfulness. 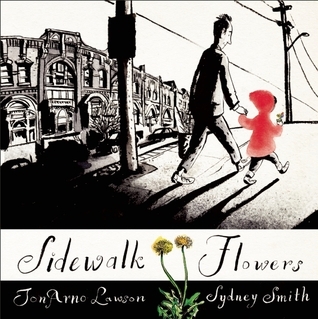 The experience of reading Sidewalk Flowers mirrors the experience of the little girl in the book- taking time to notice things, becoming aware, and delighting in the world around her. Children are better equipped for this sort of awareness, perhaps why it keeps turning up in picture books, not only Sidewalk Flowers but also in Kathy Stinson's award-winning The Man with the Violin. Lần đầu đọc ké nó trong nhà sách Kim Đồng, và mình thích ngay lập tức. Cách kể chuyện và cách vẽ màu nước của tác giả này làm mình mê mẩn, chưa kể kịch bản câu chuyện vốn được viết bởi JonArno Lawson, nghe đồn là một nhà thơ theo phong cách văn chương vô nghĩa lí (NONSENSE LITERATURE). Bẵng đi một thời gian, đến hôm qua thì mình bất ngờ được bạn tặng quyển sách này. This book is just simply my treasure. I love this "silent" children's book. I love that it starts out with only the little girl's coat having any color. It's a really cute story about seeing the not always evident beauty around you, about taking time to stop and smell the coffee, and about the love in small gestures. I wish I could read this to my little niece. We'd have so much fun making up our own dialogue for this. The whole family will read all these Goodreads Children's Illustrated book nominees for 2015 and rate all of them. To be fair, I liked this one more than any of the rest of them, so gave it MY rating, but in general, my rating is sometimes affected by the family ratings. 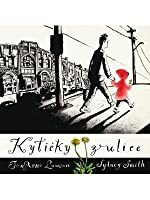 This is a silent or wordless story about a man and his daughter walking through the city and the girl picking wild sidewalk flowers and giving them to various people along the way: a dog, a homeless man sleeping on a bench, and t The whole family will read all these Goodreads Children's Illustrated book nominees for 2015 and rate all of them. This is a silent or wordless story about a man and his daughter walking through the city and the girl picking wild sidewalk flowers and giving them to various people along the way: a dog, a homeless man sleeping on a bench, and the two kids they are visiting for supper. The art is sketchy, not typical kid fare, so for me better, for the kids worse. They don't love silent books, on the whole, and I love them for lots of reasons. So much story and emotion expressed with images! And a simple, slice of life story, which I prefer; they prefer to be entertained a bit more in a bit more traditional ways, maybe. They in general might prefer to laugh, to be surprised, they might prefer a little more traditional children's artwork, not sure.and so on. Maybe that's not quite right for all of them, but in general true. The art is beautiful and the story tender, the use of color fantastic. It is a story about, among other things, the separate worlds inhabited by a kid and her caretaker. A little sad, but also full of wonder. A light little wordless picture book. We follow a little girl as she goes for a walk with her father, and returns; first she notices and picks flowers, and then she distributes them. Art's nice. Most of it in black and white and gray, with various splashes of color to nice effect. Enlarging your world, finding beauty everywhere, showing kindness, warmth... and so much more. This one is really a piece of art that should be shared around the world. This is a lovely book where color contrasts with the black and white drawings to bring the story to life. No words necessary! Wow! I am not sure where to start with this wordless picture book. A little girl walking in the city with her dad (who seems distracted,oblivious or is just letting his child do her thing) builds a lovely collection of flowers she finds in various nooks and crannies. Bursts of color are added for a flowered dress, glass vases etc. The child gives out the flowers to the homeless, animals (dead and alive), her family and lastly herself. The gifts are transformative. Sidewalk Flowers is one of the Wow! I am not sure where to start with this wordless picture book. A little girl walking in the city with her dad (who seems distracted,oblivious or is just letting his child do her thing) builds a lovely collection of flowers she finds in various nooks and crannies. Bursts of color are added for a flowered dress, glass vases etc. The child gives out the flowers to the homeless, animals (dead and alive), her family and lastly herself. The gifts are transformative. Sidewalk Flowers is one of the most loving, beautiful books I have ever come across. If the author was an American resident it would be a shoe in for the Caldecott. The illustrator, Sydney Smith creates pure magic. This is a glorious, emotional, stunning book. All books for children need to be this intelligent. So, with no words whatsoever, this book tells the story of a little girl whom walks home with her father one day whom is, alas, on his device the entire time. She holds his hand diligently. With her other hand, she holds the flowers. With her eyes, she sees the city. her father continues to absorb all that technology has to offer. The little girl holds the flowers up, then places them precisely where her father has placed his device; hers is be All books for children need to be this intelligent. So, with no words whatsoever, this book tells the story of a little girl whom walks home with her father one day whom is, alas, on his device the entire time. She holds his hand diligently. With her other hand, she holds the flowers. With her eyes, she sees the city. her father continues to absorb all that technology has to offer. The little girl holds the flowers up, then places them precisely where her father has placed his device; hers is beautiful, as a floral accessory. A sweet visual story of a little girl that sees the beauty in life that grows between the cracks and alongside ignored spots, and how that beauty can be passed along. Fantastic use of black and white with - initially - the intermittent scattering of color for emphasis which becomes more and more frequent as the reader sees what she sees. I loved it's subtly. I also loved the lack of words. As a story book for kids, it has a wealth of opportunity for imaginative storytelling for kids. Lovely, lovel A sweet visual story of a little girl that sees the beauty in life that grows between the cracks and alongside ignored spots, and how that beauty can be passed along. Este libro es completamente ilustrado, sin una sola palabra desde que inicia hasta que acaba. La historia es contada a través de preciosas viñetas que, honestamente, podría pasar horas admirando. Con puras ilustraciones este librito llegó a mi corazón y cada viñeta deja entrever un trasfondo poético maravilloso. Un libro ideal tanto para niños como para adultos. Sidewalk Flowers in a wordless story, and I don't think is a good idea to put it into too many words here. But I wanted to bring this book into your attention because it really worth a try. This story is a tribute to the small gestures that make big differences. Check out more children's book reviews in my Reviews in Chalk Blog! Our world is all about small things, small people and small gestures. There seems to be a theme in children's picture books lately of recognizing the beauty in urban environments. This wordless book is a wonderful addition to the theme. JonArno is the author of two books of poetry for adults, Love is an Observant Traveller and Inklings, as well as a contributor for The Chechens: A Handbook. The Man in the Moon-Fixer's Mask is his first book for children. He lives in Toronto, Canada, with his wife and two children.